On Friday, Tim Canova won his lawsuit against Broward County Supervisor of Elections Brenda Snipes, because she destroyed all of the original paper ballots in his race. Click on the photo to review the full ruling from the court. This legal victory stems from multiple detailed public records requests that I made, and one that Canova and I made together. I wanted to examine the ballots in this race because I worked with a team of data analysts, and they found statistical red flags in the results. Not only did the court rule convincingly that the Supervisor of Elections Office acted illegally, Politico is reporting that Florida Governor's Scott will have her office monitored. This is a major step for election transparency. In conjunction with other recent rulings in New York, Alabama and Arizona that digital ballot images must be preserved, this ruling highlights an emerging path that candidates and citizens can use to confirm election results. It clearly demonstrates their right to do so, and the important place that public records requests, and the review and verification of election documents play in the process. The public has a right to have full confidence in our elections and to be provided with evidence that the results as certified are accurate. This ruling moves us forward toward that goal. 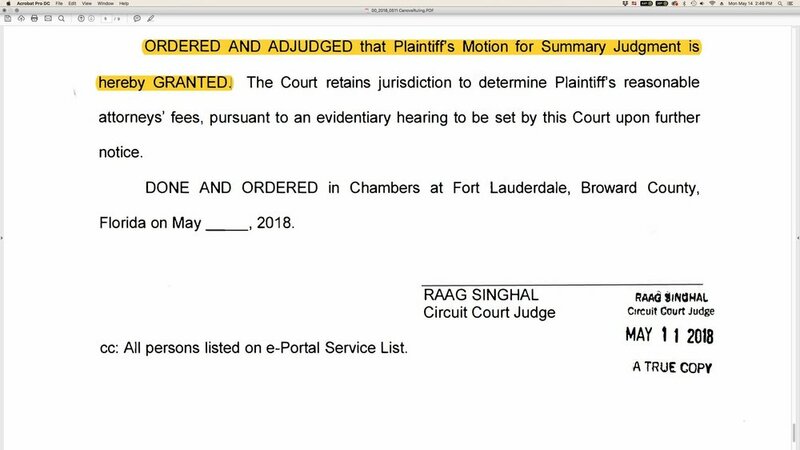 On Friday, May 11th, Circuit Court Judge Raag Singhal ruled that it was illegal for Brenda Snipes, the Broward County Supervisor of Elections, to destroy the original paper ballots cast in the August 30, 2016 primary between Tim Canova, a Nova Southeastern University law professor, and Rep. Debbie Wasserman Schultz, in Florida’s 23rd Congressional District. (1) By federal and Florida statute, ballots in a federal election must be preserved for 22 months. The ballots were destroyed after only 12 months. Violations of the statute are punishable by up to a year in prison. (2) Documents that are the subject of legal proceedings cannot be destroyed without permission from the court. Mr. Canova filed a lawsuit on June 7, 2017 requesting to inspect and scan or copy the ballots. The ballots were destroyed on September 1, 2017, while this litigation was pending. (3) Canova had sought to inspect the original paper ballots under Florida’s public records law, as permitted for any citizen under the Florida Constitution. After three public records requests by election security journalist Lulu Friesdat, and months of stonewalling by Snipes, Canova joined the public records requests and filed suit. The court ruled that it was illegal for Snipes to refuse to produce the original paper ballots for inspection as public records and to refuse to allow copying and/or scanning of those ballots. When Friesdat’s data team was able to review some of the information from the election, they found large and unexplained discrepancies between the number of voters who voted and the number of cast ballots. In all, there were more than 1,000 discrepancies, and out of 211 precincts only 19 had the same number of voters and ballots. These irregularities were highly concerning to election experts. Duncan Buell, a professor of computer science at the University of South Carolina, said, “I see what I would call a high likelihood of massive incompetence. Either that or there is fraud. I don’t think you should see numbers this big in this many precincts.” Buell has examined election records extensively in South Carolina. It is my view that the only lasting remedy requires legislation and a cultural shift: a reformed election system based on 100% paper ballots counted by hand in public would be one way to ensure truly transparent and verifiable elections. The original ballots could be scanned using open source software as a permanent backup, with ballot images and software open to public inspection. It is imperative that we improve chain-of-custody protocols. Ideally it would be best if elections are administered by non-partisan or trans-partisan officials. We have released the full investigative report into the 2016 Florida congressional primary race between Debbie Wasserman Schultz and Tim Canova. The report will shock you. Their are close to a thousand ballots more than voters who voted, and the original ballots have been destroyed. Election experts I consulted said that the results of the race are suspect; and county election officials may be subject to criminal prosecution. "... in a hearing in Broward County Florida, last month, a year-long battle to view the ballots in the race between Wasserman Schultz and Canova came to a head with a surprising admission by the Broward County Supervisor of Elections’ office. In violation of both federal and state statutes that require federal election materials be preserved for 22 months, their office destroyed the ballots from the Wasserman Schultz/Canova race after only 12 months. Broward County Supervisor of Elections Brenda Snipes personally signed off on the ballots’ destruction. ... Months of investigating the Supervisor’s office and analyzing election data reveal that in the vast majority of precincts in the race, the number of cast ballots does not match the number of voters who voted. The discrepancies are large and all over the map. Some precincts show 10 – 20 more cast ballots than voters. In one precinct alone, M030, there are 24 more cast ballots than voters. Other precincts are missing ballots. Less than 10% of the precincts have the same number of cast ballots as voters; and in all the precincts combined, there are more than a thousand discrepancies. Election experts and administrators who reviewed the data were shocked and concerned." Please donate to support this research. We need your help to continue this work. Thanks for all the encouragement I've received during this investigation. Please do read the full article and share the link with your networks! I am re-posting the link to the statistical research that I did on the results of the August 30th 2016 primary between Tim Canova and Debbie Wasserman Schultz. Tim Canova is running against Debbie Wasserman Schultz again for a seat in congress. After almost a year of protracted and contentious negotiations with the Broward County Supervisor of Elections office, we have finally gained permission to copy the ballots in 12 precincts of the 2016 primary race between Canova and Wasserman Schultz. We had to take them to court in order to do this. We now have 2 days assigned, November 1st & 2nd when we will have permission to make copies of the ballots. After that we will count them by hand. The statistical analysis of this race raised red flags, and it is important that we look at races like this to see if the results are accurate. The only way to know is to count the ballots by hand. If you believe this is important work, please support this project. We need your financial help to get this done. Please give as much as you can today. Here is the Gofundme link where you can contribute. Wasserman Schultz has been embroiled in a series of scandals this year.